Warner Bros. had one of the most effective theatrical trailers among the summer crop of films. 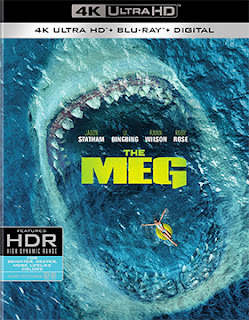 This was the previews for director Jon Turteltaub’s The Meg … it really sold the film as a “must-see” summer event! It begins with little Meiying (Shuya Sophia Cai) playing on the enclosed deck of an immense underwater research facility when suddenly a monstrous shape appears out of the darkness and attempts to swallow her whole … only the reinforced glass stops the beast! In the aftermath, however, bite marks of an ominous size remain. The trailer continues with some additional teases and in the process reveals that the creature is thought to be a Megalodon — a giant — no, make that ENORMOUS — shark that went extinct some $2.5 million years ago! This pre-launch campaign proved to be very effective as The Meg rolled to a tasty $142 million at the box office. Word arrived this past week that Warner Bros. Home Entertainment has tabbed Nov. 13 as the street date for a four-SKU helping of this chomp, chomp, chomp adventure feast. The ARR is 95 days. Among the home entertainment product options are a stand-alone DVD presentation, a Blu-ray/DVD Combo Pack, a double-disc Blu-ray set featuring 3D and 2D viewing options and a 4K Ultra HD/Blu-ray Combo Pack selection. As to the film itself, in a thrilling underwater opening sequence we are introduced to Jonas Taylor (Jason Statham), a deep dive rescue specialist, who fails in his attempt to rescue men aboard a submarine. He claims — and no one believes him — that some giant (unknown) creature attacked the sub and caused it to eventually implode. Disgraced, Taylor is forgotten … except it is now five years later and his services have suddenly become needed at the “Mana One,” the aforementioned underwater research facility. It seems that there is a deep-dive vesicle — with three people aboard, including Taylor’s ex-wife, Lori (Jessica McNamee) — that has become stranded near the famed Marianas Trench … the circumstances are eerily similar to what Taylor described five years earlier. Talk about a small world, ex-wife (how convenient), stranded submersible and an unknown creature lurking in the depths. The Meg, with that sort of a set up, could have easily gone off of the rails, but filmmaker Jon Turteltaub (who gave us the two National Treasure films) holds it together and keeps the action following at a zippity-zip pace (that way you don’t have to ask too many questions). The film works … and audiences loved it!